Human civilization arose during the relatively balmy climate of the last 10,000 years. Even so, evidence is accumulating that at least two cold spells gripped the northern hemisphere during this time, and that the cooling may have coincided with drought in the tropics. Emerging research on climate during this Holocene period suggests that temperature swings were more common than previously thought, and that climate changes happened on a broad, hemispheric scale. Ads by Google Temporal Thermometer - Accurate temperature with a gentle forehead scan. Doctor recommended. - www.exergen.com In a new study in Geology, Irene Schimmelpfennig, a postdoctoral researcher at Columbia University’s Lamont-Doherty Earth Observatory, and her colleagues find that one glacier in the Western Alps was bigger than today during at least two periods in the last 10,000 years—during the well-documented Little Ice Age between 1300 AD and 1850 AD, and at an earlier time, from 3,800 to 3,200 years ago. 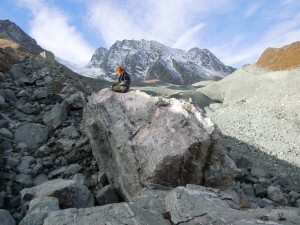 By analyzing the chemical make-up of these rocks, scientists can estimate when the glacier retreated. At Tsidjiore Nouve Glacier, Schimmelpfennig found signs of the earlier cold snap from 3,800 to 3,200 years ago. This cold period also shows up in climate records collected elsewhere in the European Alps. From seafloor sediments retrieved off Venezuela, scientists can see that the two cold spells in the north coincided with a drying in the tropics as the rain belt that circles earth’s equator pushed south. “The glacier’s behavior is not a regional response to regional changes in precipitation, said Schimmelpfennig, a member of Lamont’s Cosmogenic Dating Group. “There must be a driver on the hemispheric scale. 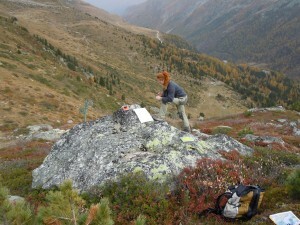 ” Schimmelpfennig will continue collecting rocks in the Alps to document Holocene climate shifts at the mid-latitudes.